Perfect for the small family, "Just for the Halibut",this condo soothes your senses with soft blues and greens to compliment the colors of the water. The condo can accommodate up to 6 persons located on the 8th floor. This enjoyable vacation home comes fully equipped with a kitchen (pots/pans and dishes are included) and washer/dryer. Bedding includes a king sized bed in the master bedroom, bunk bed alcove and a sleeper sofa in the living area. The living area includes seating for six and a table and chairs for meals. 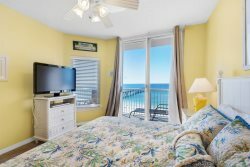 Sliding glass doors open onto your own private balcony overlooking Navarre Beach. Sip your morning coffee or have a full breakfast on the balcony while listening to the soothing sounds of the gulf. Build sand castles or dig your toes in the bright white sand or splash in the emerald green waters of Navarre Beach. Summerwind Resort's amenities include gulf front swimming pools (one pool heated in winter), hot tubs and fitness center. Conveniently located within walking distance to the Navarre Beach Pier, restaurants and parks. Finding the mail office was very easy. The little emails we would get leading up to our stay helped since this was our first time staying there. The emails would tell us about local restaurants, convenient stores, and other attractions. Staff was so friendly and checking in was quick so we could get right to our vacation. My wife and I have already determined to come back. The website couldnt have been more user friendly. Everything from the check in until the check out was 5 stars. Thank you team for being great hosts. Property was very clean and alot of the appliances were updated very recently. Beach was very private and enjoyed talking with other friendly guests that were there as well. We felt the rates were exceptionally reasonable. We have already been recommending to friends and family. See you next year! Breath taking views. Super clean condo. Bright and cheerful, relaxing color scheme inside the condo. Love it! We thoroughly enjoyed it. We will probably be staying there again in the future. Everyone was friendly especially the security guard they were really kind.